For Edward Reynolds (’64), coming home to Wake Forest this past weekend meant a standing ovation from more than 500 people in Brendle Recital Hall and emotional reunions with many of the students, faculty and administrators who helped him when he enrolled as the first black undergraduate student at Wake Forest 50 years ago. 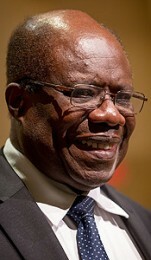 A Ghana native, Reynolds took his first Wake Forest classes in 1962 and lived in Taylor Residence Hall. “Since I was the first one, I think people invested a lot, and they ensured that I would be successful — people from the black community, the campus community,” said Reynolds, who graduated in 1964 with a bachelor’s degree in history and went on to become a professor of history at the University of California, San Diego. Alumni, current students, retired faculty and staff, and community members gathered Sept. 21 for the premiere of the documentary film, “Faces of Courage: Wake Forest’s Impetus to Desegregate,” and a panel discussion featuring Reynolds, his roommates from 1962 and others instrumental in Wake Forest’s transition to a racially integrated school. Glenn Blackburn, a 1963 graduate and the leader of the African Student Program who mobilized student and faculty support to raise money for Reynolds to attend Wake Forest, was among the panelists. The panelists shared their experiences and stories, responded to questions that had been submitted in advance by students and then took questions from the audience. Darius Williams asks a question. Wake Forest President Nathan O. Hatch introduced the program and presented the Faces of Courage Awards to Reynolds and those who had important roles in supporting him at Wake Forest. 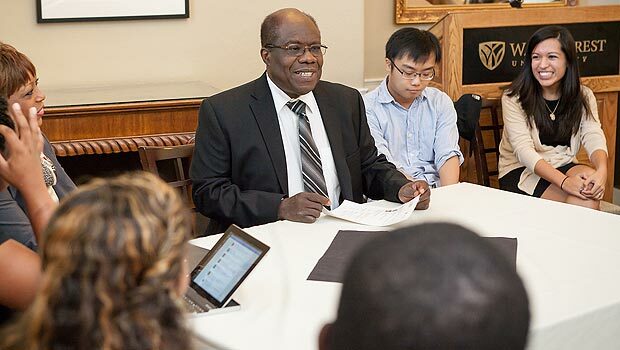 While on campus, Reynolds also met with small groups of students, guest lectured in Professor of History Anthony Parent’s class, “Africans in the Atlantic World,” and met with Winston-Salem community members. Ed Christman (right) talks with students. 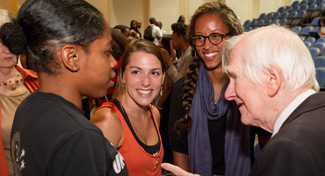 The film, created by Chris Zaluski, a student in Wake Forest’s Documentary Film Program, and produced by Matt Williams, assistant director for the Office of Diversity and Inclusion, concluded with a comment by Ed Christman (’50, JD ’53), the Wake Forest chaplain who advocated for integration and became Reynolds’ friend. The event was part of “Faces of Courage: Celebrating 50 Years of Integration,” a yearlong series of events designed to encourage discussion, bring people together and honor those involved in making Wake Forest a more inclusive place. Panelists: Glenn Blackburn (’63), Barry Dorsey (’65), Martha Wood (’65), Joe Clontz (’64), Ed Reynolds (’64), Ross Griffith(’65) and Anthony Parent, professor of history.